The wound, a heart broken. Broken in smithereens. How do you find the pieces? How do you become whole again? This is The Shattering. The personality shatters. Who you were is no longer who you are. How do you begin again? Where do you start? Begin with Faith and the idea of Wholeness. The idea that you are a Soul and part of the Wholeness of Soul Life. Paint things that are whole. Paint plums. Paint peaches. Plums. Plummy reddish purplish bluish, reddish purple, bluish purple, backish purple plums. Round and whole. Candlesticks, like sticks, sticking up. 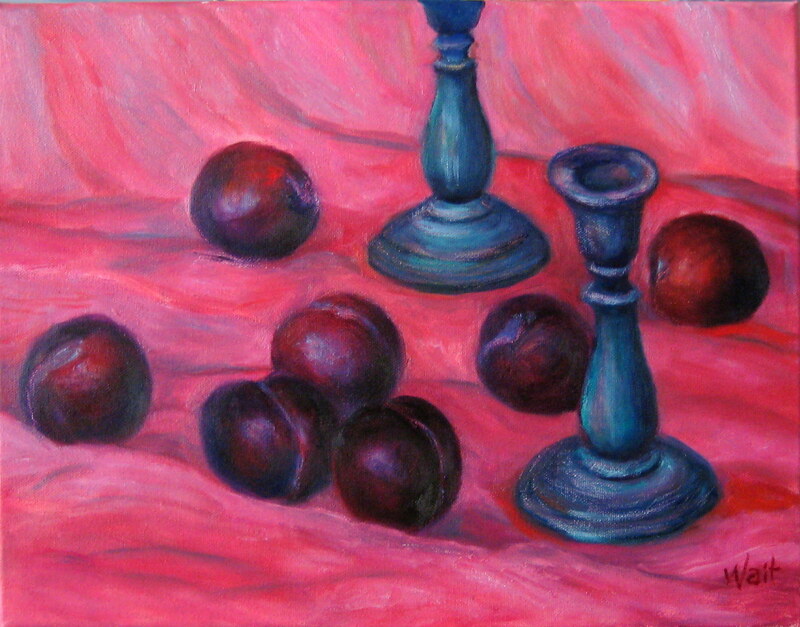 Plums rolling round the cloth like little balls, candlesticks sticking up like trees. Single plums, plums in bunches. Plums. Round things that roll around. Peaches. Peaches and cream. Round fruits, orange yellow golden fruits, mouth-watering fruits, peaches. Peach stones hidden inside. Peaches in a basket. Peaches in a basket sitting on a cloth. Peaches in a basket sitting on a cloth against a dark blue background. The dark blue background shows off the peachy color of the peaches. All we need is a bowl and a spoon. We have the peaches. We have the cream. We need a knife to cut the peach into bite-size pieces. Then we need a bowl to put the pieces of peach into. And then a spoon. We need a spoon, because when we pour in the cream we will want a spoon to scoop up some peaches covered with cream. Peaches and cream. Peaches. Peaches are whole. Plums are whole. Until I bite them. Until I cut them. Until I eat them. If I eat them. Maybe I will just paint them. Maybe I will just eat them with my eyes. See their wholeness. Paint their wholeness. With my whole self. Am I any less whole then these? 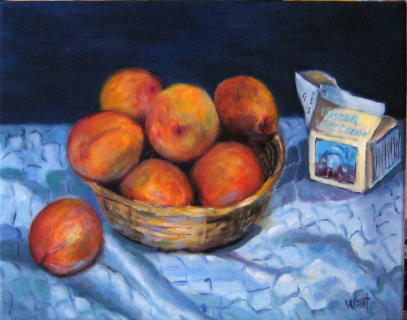 This entry was posted in Wounded Healer and tagged Art, fruit, paintings of fruit. Bookmark the permalink.